Win the Outdoor Advertising Pennant! Pennants are a low cost way of attracting attention. These bright, colorful strings command attention from both pedestrians and riders. Pennants are ideal for highlighting businesses, strip malls, special events, or anywhere attention should be focused. Pennants are an ideal addition to other forms of on-site outdoor advertising. When used in combination with a helium ball or blimp, they direct attention from the high-flying promotion to the storefront. Like many temporary outdoor advertising promotions, pennants are an excellent way to change the look of a business storefront, and keep local commuters aware of a business. Using your logo colors in a pennant helps to reinforce the awareness of your business. 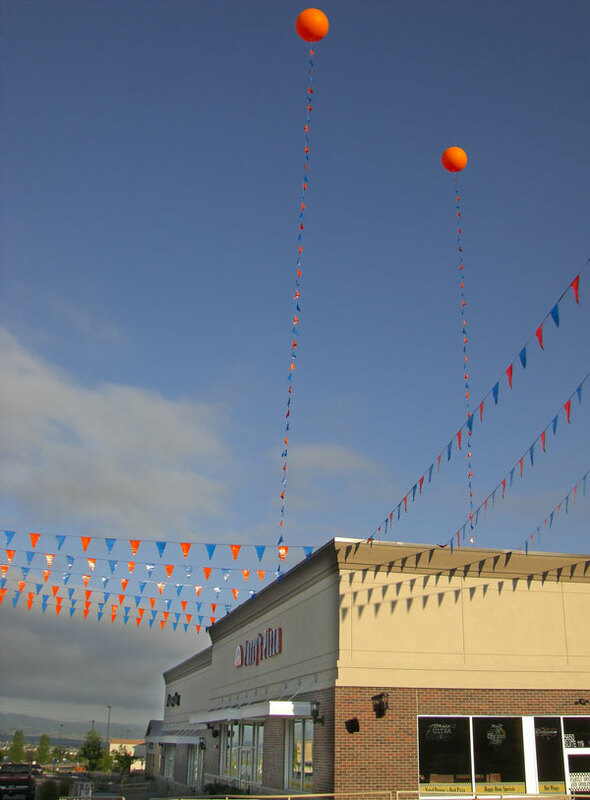 Pennants lines used to secure helium balls or blimps, or ground-based inflatables can create a synergy that amplifies the promotional message. With 15 years of local outdoor advertising experience, Spot knows how to install pennants correctly in the Denver Metro area and all of Colorado. They'll look great and stay up! Our pride shows in our work. See the obvious difference between a professional pennant job and a do-it-yourself pennant job.